Like a phoenix, it’s flaming wings rendering liquefacted silt into weirdly shaped shiny psychedelic ceramic sculptures as it rises from the quake-decimated ruins of Christchurch’s State Trinity Centre, the penultimate Axemen tome “Three Virgins, Three Versions, Three Visions” (commonly referred to in hushed tones as simply “Three Virgins“), well, more accurately, the four fragile lacquers of which are currently and patiently awaiting their turn at R.T.I. USA. Soon those lovingly engraved mothers will be slammed into steaming 180 gram piles of black vinyl, and slipped into exact replicas of the intricately elaborate 4-colour gatefold sleeve, the cost of said practically bringing Flying Nun Records to it’s knees back in the Christchurch of 1986. 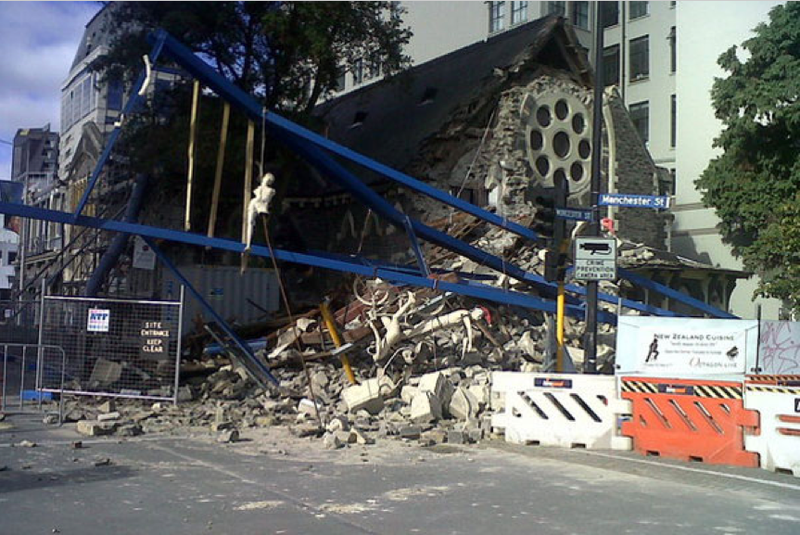 The 22/2/11 quake-decimated ruins of Christchurch’s State Trinity Centre. Kawowski’s vain effort to bake the original 7″ masters in a food-dehydrator, and transfer digitally proved unacceptable to his high standards of aural sensitivity. With the upwards nodding approval of the other 2/3 of the legendary flat-city triad, Steve ‘n Bob, together with the blessing of the sage Siltbreeze label boss T. J. Lax, Germany’s and possibly the world’s pre-eminate ‘needle drop’ exponent Thomas Hartlage of SHADOKS™ was contracted to place his own virgin pressing of the original 1986 pressing onto his unspeakably expensive transcription system, the result being a beautifully crafted replica with all aspects and nuances of the tricky trio’s debut vinyl of PQ (pre-quake) ChCh yesteryear. Not sufficiently content with this scintillating facsimile, the 24bit WAVs were broadbanded south to a dijkside upstairs warehouse near Amsterdam, where the legendary FIR International wove his mastering magic upon the 22 tracks, and soon after Mark at Prairie Cat Mastering in Illinois had manifested the four sides of the 88 minute set in shiny, shiny lacquer. An announcement will be made shortly regarding worldwide availability of these waxy widgets. Keep watching here, and AXEMEN on Facebook. Stop Press: In a generous 11th hour gesture, Shadoks & Fir International donated 60% of the mastering costs to the Christchurch Earthquake Appeal. In fact the whole exercise of re-releasing Three Virgins is all about the music, as the small 2nd edition pressing run will only produce 600 copies, and not return much of a profit to Siltbreeze’s hungry shareholders. The Axemen are very cognizant of this fact and super-appreciative of everyone’s efforts and generosity all round. very excited about Three Virgins re-ish. where do we pre-order?